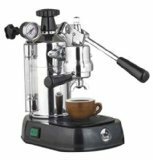 Europiccola Italian made espresso maker features are many, including a 38 ounce boiler capacity. Makes 16, 2 ounce cups of espresso. By lifting the lever one raises a piston inside the group, allowing water under pressure to infuse the coffee in the filter holder. The lever is then lowered, causing the piston to force the water through the coffee into the cup. The user therefore can vary the speed at which the water passes through the coffee, ensuring it is made exactly according to his own requirements. Steam jet: it enables to obtain a frothy, warm milk, as well as tea or any other hot drink; . It also has a mounted pressure gauge.